Tencent beat earnings expectations thanks to ads and a whopping one-time gain, buying it time to find an answer for its plateauing core gaming business. The social media titan posted net income of ¥23.3bn ($3.4bn) for the September quarter after recording a windfall of ¥8.8bn from investments, including the debut of Meituan Dianping. But revenue grew at its slowest pace in three years as a Chinese clampdown on gaming licenses continued to hammer its bread-and-butter division. The government has effectively frozen new game approvals, which means Tencent’s been unable to make money off global hits Fortnite and PlayerUnknown’s Battlegrounds. That’s seen the stock - the biggest member of the MSCI Asia Pacific Index - shed more than $240bn of market value since a January peak. 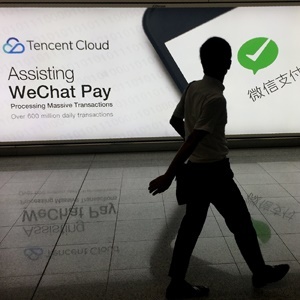 While China is trying to combat gaming addiction and is reshuffling regulators, uncertainty persists with Tencent counting on its WeChat social network, advertising and belt-tightening to tide it over the drought. Tencent’s earnings also bucked a recent trend of disappointing results from China’s technology companies as a slowdown in the economy dampens the outlook. Alibaba cut its outlook for annual revenue, while search leader Baidu also predicted sales below estimates. Naspers, the biggest shareholder in Tencent, gained more than 3% in Johannesburg. The profit rise of 30% compares with analyst estimates for growth of about 2%. The company is also the biggest backer of Meituan, a food delivery and local services giant that held its initial public offering in September and provides another avenue to reach consumers. That sheer reach is helping power its marketing machine. Online advertising jumped 47R in the third quarter. The gaming division however still yields more than half its revenue, though that proportion’s dropped steadily as Tencent leverages WeChat. The Value Added Services business, which includes games, grew just 5%. Drilling deeper, revenue from smartphone games climbed just 7%, while sales from PC titles dropped 15%.